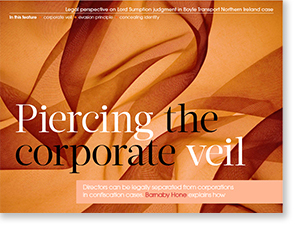 Barnaby Hone recently had his comment piece on ‘piercing the corporate veil’ published by TS Today magazine. This article explores how directors can be legally separated from corporations in confiscation cases. TS Today magazine contains the latest news and views that directly concern trading standards professionals and others who work or do business within the regulatory framework. Click the thumbnail below to access the full article.